I know it probably seems like The Spiced Life has gone bacon crazy lately, but as I mentioned in the Bacon and Farro Salad post, I just fell hard and fell quickly for Bacon Nation: 125 Irresistible Recipes. At the same time, I needed a recipe that could stand up to shipping, i.e., not go stale too fast, because it is time once again for The Leftovers Club. 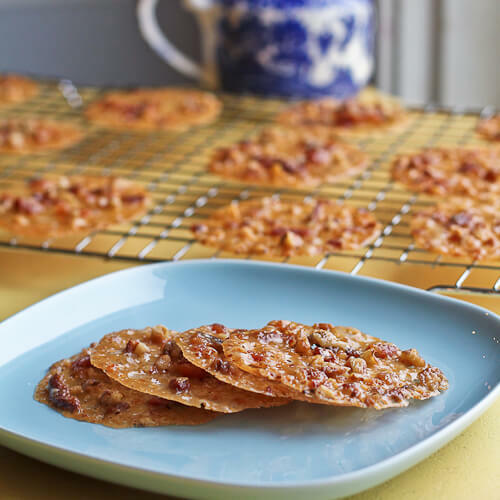 Aside from needing to be packed carefully, these Bacon Lace Cookies fit the bill perfectly. I loved these cookies, although it does need to be said that they are rich and candy-like, and therefore they are not the kind of dessert you can eat a lot of in one sitting. 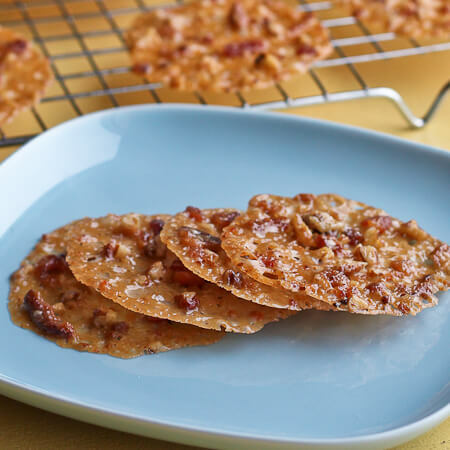 The sweetness of the pecans and the caramelized notes of the actual cookie perfectly complement the smoky, salty bacon. The texture is a fabulous combination of crisp and chewy, much like bacon itself. This month my partner for The Leftovers Club was Jen from Juanita’s Cocina (guys! I keep getting the BEST swap partners! ), and she sent me some fantastic lemon cookies. Like a dolt I already lost the card she sent (she definitely wins the award for most attractive packaging too), so I cannot remember their exact name but they were delightfully crumbly and snowball shaped. Be sure to check them out, along with everyone else’s swap creations below. Closely adapted from Bacon Nation. Using a teaspoon measure, drop teaspoons of the batter 3 inches apart on the cookie sheets (I placed 6 to a sheet). 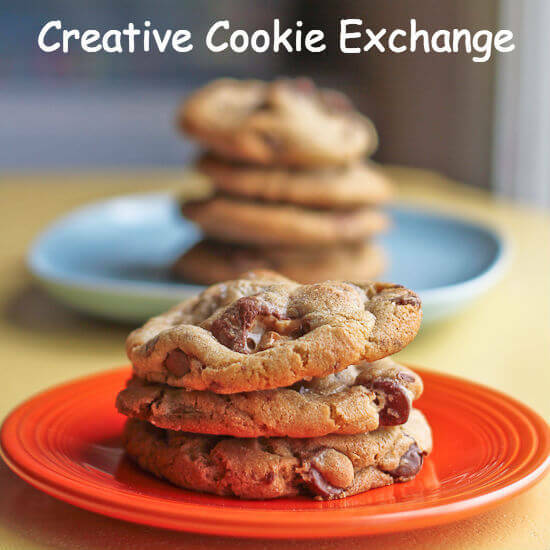 These cookies will spread--truly use just a teaspoon of the batter. Store the cookies between paper towels--although this cookie does not taste greasy, much like bacon itself it benefits from resting on paper towels to absorb any excess oil from the nuts and bacon both. The paper towels will also prevent sticking. These are awesome!! I love the look of them and I know I would adore the crunch & flavors! A great idea for TLC!! For real? Are these even legal?! They look and sound incredibly delicious and addictive. I’m going to take a chance and give them a try, just wondering if they come with a warning label….? Great post, and wonderful idea. Oh wow! 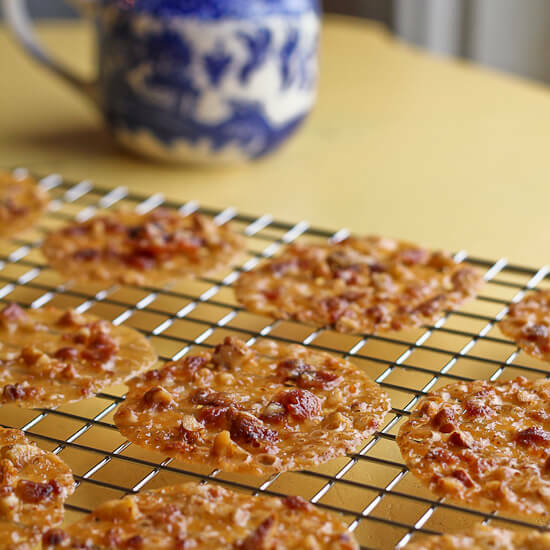 I love lace cookies and I think the addition of bacon is just perfect! Jen is on lucky gal to have been partnered with you this month! Very interesting. I think I want to try one…I think. zowie! that looks amazing. I generally avoid bacon but I might eat this if it came my way. These were FABULOUS! Thank you sooooo much! I keep seeing that book on The Good Cook and keep thinking of you! Jen was one lucky girl to receive these! You can never go wrong with bacon-laced cookies. You just can’t. These look wonderful! I haven’t tried the bacon in sweets host but your cookies are mouthwatering. Can’t wait to try them. Oh wow. It’s been a while since I’ve had dessert with bacon, and these look just perfect! Oh heavens – perfection – bacon, cookies, pecans… awesome! What a clever recipe! !